Non-surgical treatment to remove plaque and calculus from the tooth’s surface. 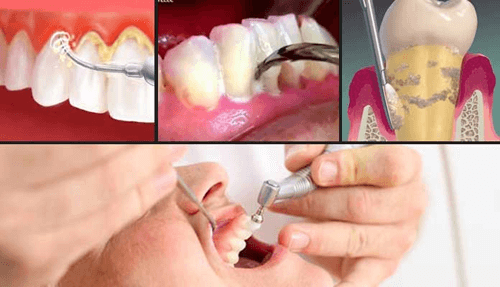 It is a very important part in the therapy of the periodontal disease and it is done with special hand instruments and ultrasonic instruments. When dentists perform planing and scaling they remove all the remains of food, debris, plaque, bacteria, calculus, tissue, and even parts of the cementum and dentine. They start with all the hard deposits until they get a clean surface that can restore parts of the periodontal connective tissue. This is a very important step in the treatment of the periodontal disease. Patients always start the treatment with non-surgical intervention. This procedure is necessary for people who suffer from periodontal disease. This condition has to be taken care of right away and with a lot of care. If it is not treated, it can lead to tooth loss. Improper oral hygiene, with plaque buildup and tartar, lead to a destruction of the periodontal ligament. These deposits have to be removed so that the tissues can connect once again. The damage of the periodontal disease is irreversible. The good thing is that the disease can be stopped. A regular visit to the dentist and perfect oral hygiene are required. It is the most common non-surgical way to treat periodontal disease. Planing and scaling are done in order to remove all the plaque, calculus, debris, dead cells and bacteria from the surfaces of teeth. It is all done in the dental office. The procedure often requires the use of anesthesia, since it can be very painful. The dentists treat one-quarter of the oral cavity per visit because it is a detailed procedure. In easier cases, they can do one whole jaw. Also, the patient will need time to recover after the treatment and that is much harder if both jaws are involved. Applying anesthesia to both jaws is not recommended. Dentists use both hand instruments and ultrasonic scalers during planing and scaling. The first step is removing all the hard deposits such as calculus and the soft ones like the plaque. Once all of that is done, the following step is root planning, which means smoothing the surface of the root. The first part can be done with hand instruments, but it’s much faster and easier with an ultrasonic scaler. The planing part of the procedure removes parts of the dentin and the cementum, to get to a completely healthy tissue. That is why a lot of patients experience hypersensitivity. The whole procedure requires four visits to the dentist. Once it’s done, the patient might need to take antibiotics to help them with the periodontal disease. Local antibiotics can also be placed in the periodontal pockets. It all depends on the type. The patients are also prescribed medication for sensitive teeth and are advised to use toothpaste for hypersensitivity. These people have to visit the dental office more often so that the dentist can keep the periodontal disease under control. Some patients can decide for additional surgical periodontal procedures, that can be very helpful.